Beyond Toxics, a nonprofit organization committed to environmental justice in Eugene, Oregon, provided culturally specific asthma education to low-income communities in West Eugene's Industrial Corridor. Low-income and Latino families living in the Industrial Corridor "are surrounded by 50 air toxic release sites and two Superfund sites, emitting thousands of pounds of air toxics daily. These residents often live in homes with indoor air problems," said Lisa Arkin, Executive Director of Beyond Toxics. Beyond Toxics held 20 integrated "green cleaning" and asthma self-management education sessions for residents. "Our asthma education outreach included designing tailored workshops for diverse groups," explained Alison Guzman, Projects and Outreach Manager. The educational activities "on asthma and its triggers were provided to children in English and Spanish," continued Ms. Guzman. Childhood asthma rates in the Industrial Corridor are over 14%, compared to only 9% nationwide, according to the Centers for Disease Control and Prevention (2010). Beyond Toxics worked with area mothers to advocate for clean air. "Everyone has a right to clean air," said Ms. Guzman. Beyond Toxics provided community members contact information of relevant agencies in the area to inquire about air quality and other environmental health issues—in English and Spanish. Over 200 Latino residents "have received targeted bilingual programming in asthma prevention, green cleaning, and environmental health protections," said Ms. Guzman. Several barriers, such as linguistic and cultural barriers as well social isolation, exist in West Eugene's Industrial Corridor. Through funding from the Office of Disease Prevention and Health Promotion (ODPHP), Beyond Toxics was able to provide culturally relevant services and mitigate some of these barriers in addressing critical aspects of environmental health and justice. 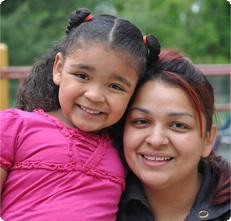 "Our staff is dedicated to educating small groups of 5 to 15 women or families at a time," stated Ms. Guzman. While this is "very staff-intensive work," Beyond Toxics strongly believes "this is the most effective outreach," Ms. Guzman continued. Furthermore, "for every 10 people that we serve, we estimate that we are able to reach an additional 40 people and their families," mentioned Ms. Guzman. "Word-of-mouth is important," explained Ms. Arkin, for families that do not have access to traditional ways of gathering information such as through email or the Internet. Beyond Toxics strongly believes that their "particular style of engagement also empowers individuals to participate in community actions to improve quality of life," explained Ms. Arkin. At an Environmental Justice Bus Tour in April 2012, 6 Latino mothers, speaking Spanish, "talked to the Mayor, City Councilors, and other elected officials about air quality and its role as a trigger for asthma for children in their neighborhood," recounted Ms. Guzman. Although community members are more aware of the impact of environmental pollutants from the different toxic release sites, Beyond Toxics staff identified areas for program improvement. Ms. Arkin explained, "We would have begun by talking with mainstream civic organizations to help confront the uneasiness about serving the Latino community and engaging them to participate in local community decision-making." Empowering Latino Leaders "to be a "voice'"
Beyond Toxic staff also realized they needed to make "more connections between our local public health issues and the larger national conversation," said Ms. Arkin, particularly in future programming with residents, politicians, and other community members in West Eugene’s Industrial Corridor. One important lesson Beyond Toxics staff learned was the value and importance of community partnerships. Ms. Arkin believes, "Community partnerships are critical because they help us to establish validity and trust with the people we are trying to reach." There is still more work to be done in West Eugene's Industrial Corridor, as "health advocacy often drops off of their [low-income families'] radar," said Ms. Guzman. Beyond Toxics is ready to continue advocating for environmental justice alongside community members in West Eugene's Industrial Corridor. The Office of Disease Prevention and Health Promotion (ODPHP) challenged America’s health organizations to come up with new and innovative projects that could tackle some of today’s most pressing public health issues.